Tohta sensei is the grand old man of modern haiku in Japan. I see him often on TV and admire his vitality and points of view. 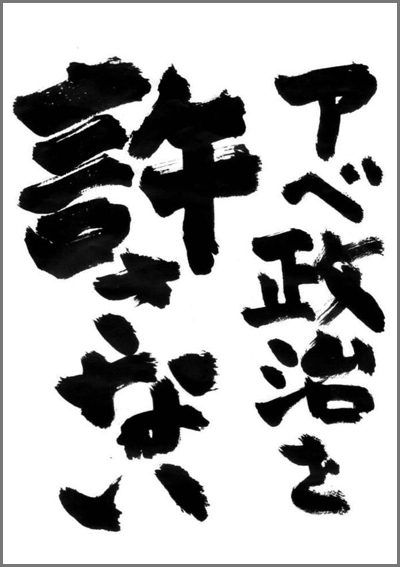 "Mu Kigo 無季語", haiku "without a season word". 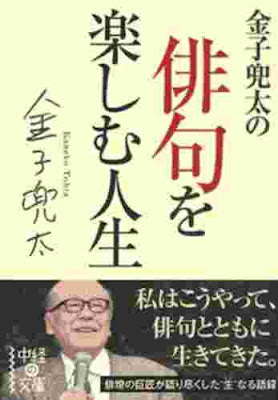 He was born in 1919 in Chichibu, the mountainous area of Saitama Prefecture and began writing haiku when he was 18 years old. Attracted to haiku through the works of TAKESHITA Shizunojo, KATOH Shuuson and NAKAMURA Kusatao. 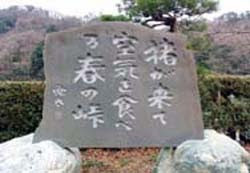 First submitted to KATOH Shuuson's "Kanrai" in 1941. 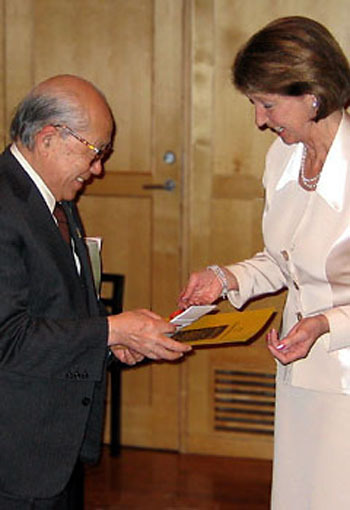 Graduated Tokyo University in 1943 and started working for the Bank of Japan. Posted to Truck Lagoon as a Naval pay officer in 1944 and repatriated in 1946. After the war he emerged as a flag-bearer for avant-garde haiku and started the haiku group "Kaitei" (Distance to the Sea) in 1962 at the age of 43. 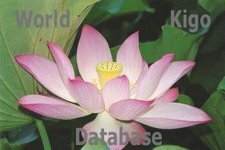 "Kaitei" changed from a coterie magazine to a hierarchical structure in 1985. From before the War until 1955 he stressed the importance of "plasticism" and "sociality" in haiku. His second phase was from the mid sixties to 1975 when he studied classical haiku in depth as a result of heated debate between the conservative and avant-garde factions within the group. The present phase is his third and it is characterized by the popularization of haiku as "poetry for the masses" grounded in the works of such poets as Issa and Santohka and blending the traditional and avant-garde in the melting pot termed "Modern Haiku". To "practise the modern in the grandeur of the old" is his current catch phrase. He has published over 50 books starting with his anthology "Shounen" (A Youth). Now Honorary President of the Modern Haiku Society and selector for the Asahi Haiku Column. A feature film of NHK showed Tohta sensei well and active. The hot summer of 2010 had adverse effects for him. After a short stay in hospital for low blood pressure, he was able to go back home and continue his haiku meetings. He still reads about 6000 postcards with haiku to judge for competitions. He rubs his body with a towel every morning, adding exercised to keep the body flexible. He walks a lot to keep fit and enjoys the garden, which his wife had planted with all the trees and plants from their home region in Chichibu some 40 years ago, when they moved in. His wive, Minako　皆子, had died four years ago of cancer; he now lives with his son and daughter in law, who care for him. She has written many haiku about spider lilies (manjushage) and many haiku which describe her love for her husband. In 1970, I was very interested in the wandering poets Santoka and Issa. Although Issa is not usually considered a wandering poet, I was especially drawn to him. Even now I like him more than Basho, Buson, and Shiki. When I tried to see what drew me to him, I found an indescribable accessibility in his poetry. I do not want to use the term "mass appeal," but his haiku are so easy to understand. "Carrying poppy plants /passing by / someone fighting"
"Lice on paper scapegoats/ carried away/ by the stream"
Both are easy to understand and wonderful haiku. Two requirements of haiku are artistic quality and general appeal. Isn't it enough for a haiku to possess these two elements? Depending on how these two elements are joined, haiku can be compared with other forms of poetry. Since that time, I have tried to learn how to accept these two elements of quality and appeal. As a result, my haiku have changed a great deal. Plainly stated, I wanted to create haiku that all could understand and love by all. My poems do not necessarily have to be loved, but I want them to be understood. With this in mind, I have continued trying to find my way. I used to think that quality mattered more than popularity, and that it was all right to write as I pleased. But I changed after the seventies. As a result, I fumbled about in various ways on my own. Some years ago, I asked some friends to show me some haiku loved by everybody and possessed of artistic merit. I wondered what would they come up with. We settled on three examples. Basho's "An old pond/ a frog jumps in/ the sound of water" was the first chosen. Another was Shiki's "Eating a persimmon/ the sound of a bell/ Horyu Temple." And the third was Kusatao's "Snow is falling/ Meiji/ so far away." IKIMONO FUEI: Poetic Composition on Living Things, by Kaneko Tohta. THE FUTURE OF HAIKU: An Interview with Kaneko Tohta. These two handy pocket-size volumes are the first of four to be issued by the Red Moon Press, all dealing with the haiku poet Kaneko Tohta (b. 1919), and intended to introduce his work to a wider readership abroad. The other two, scheduled for later this year, will be translations of his haiku. This is not the first time Kaneko's work has been translated, but it is by far the most substantial introduction to it. The compact burly figure of Kaneko has been for a number of years a familiar figure on television, and some of the footage from programs in which he appeared was incorporated into a DVD called "Ikimono" (Kinokuniya, 2009) in which he spoke about and read his work. 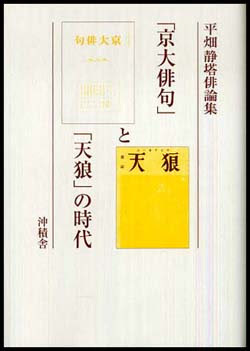 "Ikimonofuei" consists of a translation of a lecture that he gave to the Modern Haiku Association in Japan in 2009, outlining his approach to haiku composition. It does not deal with small matters like syllables and images, but larger and more basic questions. The word ikimono means "living things" and in the characteristically bold opening to his talk Kaneko sets himself firmly in opposition to the ideas of Takahama Kyoshi (1874-1959), whose conservative practice had wide influence and a large following throughout the 20th century in Japan. "I want to speak in a more humanly alive narrative voice; I feel I must express myself with this living human body." Kaneko Tohta appeared in the NHK Haiku program. 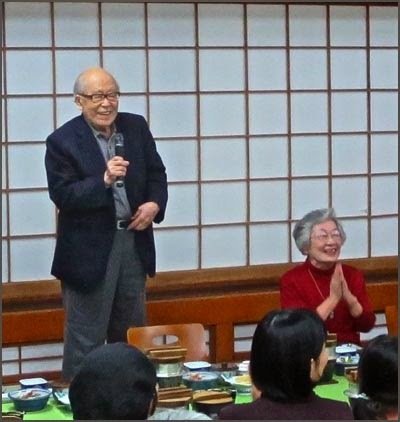 At age 92, he was genki, healthy and witty as ever. and this year celebrates 50 years of it. Lately he sees haiku as an expression of animism. An experience from his life in the mountains of Chichibu, close to many wild animals. "To die or to live?" must be dumped into the sea! I chew a piece of takuan. Takuan, pickled radish, was one of the last food items an average Japanese could get during the war years. Written in the Hongo district of Tokyo, an area that suffered heavy air raids during World War II. 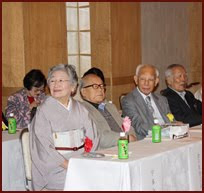 A group of haiku poets, founded in 1948.
. I become the motorbike .
. The inner organs 五臓六腑 gozoo roppu . Here we can feel one part in reality and one part in phantasy, almost like in a painting of Salvadore Dali. Kaneko sensei likes large wild animals, I heard him say once, also elephants and other big fish. You can see a white elephant in the illustration. When Japanese people die, their corpse becomes a "sleeping hippopotamus" (shi kabane) ... kaba ne, sleeping hippo. Yamada: 'A blue shark is coming'?? At that time already the whole body of the garden was, especially in the morning, filled with blue. Blue like the bottom of the ocean. Blueish air, you see. I guess you could say that it was filled with the power of the welcome of Spring. Anyhow, the life of spring came in, you might say, it was that kind of feeling. So, I got up in the morning and suddenly seeing this, I had the sensation of a blue shark swimming. Like that, this was one done at once though. My way of doing it, when I see something, rather than carefully writing what I see, I depend on the feeling that I got while seeing it, and from that feeling write various things using imagination. Virtually, this is my style. I include fictions from my imagination and reality, which is somewhat a random method no doubt. For me, that is appealing. 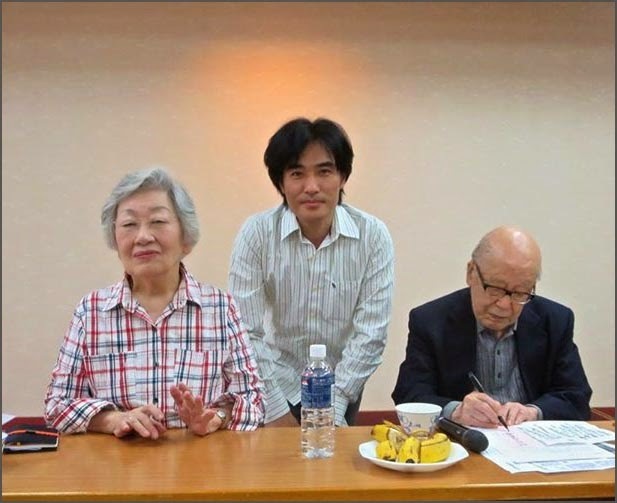 After the war, he has been working at various branches of a bank and here in Kobe he saw his fellow workers every morning coming to the office, each one had a small fluorescent lamp on his desk which he switched on to show he was there and working. This reminded Kaneko sensei of the hotaruika.
. Haiku about bones of salmon 骨の鮭 . is my friend, too . . .
“abu” (horsefly) is a spring kigo. The poet may play with the sound of ‘abu’ and ‘abunai’ (dangerous). translated by The Kon Nichi Translation Group.
. . . There are a number of sloppy errors in the book like this, which is really a pity, because it is otherwise a valuable introduction, with much fascinating detail. . . . But a poet of the caliber and distinction of Kaneko Tohta deserves to be treated with a lot more care in the editing and presentation of his work than he gets here. were raised Saturday across Japan by protesters against controversial security bills that were forced through the Lower House on Thursday. 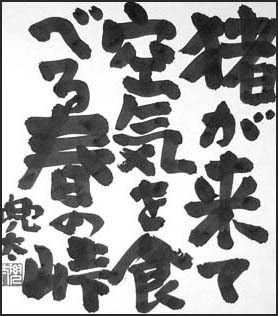 This calligraphy was written by the Haiku Poet Kaneko Tohta! you can print out this poster at any convenience store in Japan . . .
and hang it into your window and distribute it to your friends . . .
. Japanese Politics . . . .
Beautiful selections, these. War does tend to expose our vulnerabilities and sharpen our senses. When it came to my attention that Kaneko Tôta had won the prestigious Masaoka Shiki International Haiku Grand Prize for 2008, it seemed fitting (and exciting) to begin this series with a haiku by him, especially since his work is not well known in the west. Kaneko Tôta was born in Saitama Prefecture, Japan, on September 23rd, 1919. 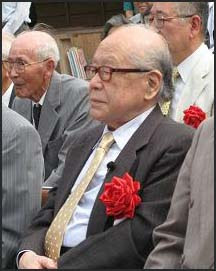 Since 2000, he has been the Honorary President of the Modern Haiku Association (Gendai Haiku Kyokai). What follows is not just the poem in translation but an entire menagerie of translations and commentaries on it from different poets and scholars. This installment began small, but quickly grew to have a life of its own. Because of its size, I have decided to split it up into a few parts. I can’t thank those who contributed to this posting enough for their thoughts and time. I encourage anyone reading this to have a go at translating it themself, and to offer any other light that can be shed upon it. Thanks, gabi san, for your insight into Japanese poetry and for sharing these tidbits of insight with us. I always look forward to your postings. I feel it is time for a major work in English (and other languages) on the work of Kaneko Tohta, and his immense influence on the continuing quality of haiku both in Japan, and outside.
. Kaneko Minako 金子皆子 . It is with great sadness that we hear that Tōta Kaneko has passed away. He was a leader in the postwar haiku world, and died from acute respiratory distress syndrome at a hospital in Kumagaya, Saitama Prefecture, on Feb. 20. He was 98 and still wrote highly relevant haiku, and kept his eye on our freedoms, when so many people looked the other way, he didn't. He was just on the cusp of turning to 99 years of age. Less than two years ago he was still active in politics, or rather, our freedoms. Protests against the security-related legislation held up placards reading "Abe seiji o yurusanai" (We will not tolerate Abe's politics), written by Tota Kaneko, in Tokyo's Nagatacho district in July 2015. A great man has left us, a man of conscience who saw the wrongs of war and, deliberate miscommunication and greed first hand at the close of the second global war of the mid-20th century. Tōta Kaneko (金子 兜太 Kaneko Tōta), (Chichibu, September 23, 1919 – Kumagaya, February 20, 2018).